I had leftover spinach and mushrooms that I wanted to use. 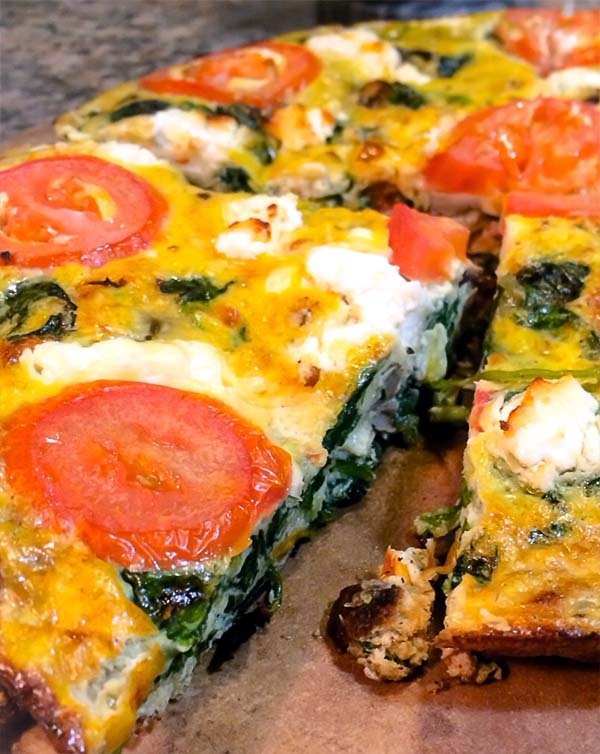 Browsing for ideas on Pinterest, I ran into this wonderful recipe for a spinach frittata by Laura Vitale. Very easy to make and can be prepped for breakfast, lunch and dinner. It's also meatless, so appropriate for some type of vegetarians. In medium heat, sautee spinach on olive oil with garlic. Set heat to low, and leave alone while making egg mix. In a big bowl, combine eggs, milk, salt, pepper, and shredded cheese. Whisk until well combined. Increase stove back to medium heat, mix spinach to make sure it's sauteeing properly. Combine egg mixture with spinach. Cook for 5-7 minutes until most of the egg mix is set. At this point, you're setting up to broil the frittata for its final finish. So preheat the broiler. Also, at this point, I added sliced tomatoes and mushrooms on top of the frittata. Sprinkle on top grated parmesan and goat cheese evenly over the top. Cook frittata in the broiler until the top is just golden brown and cheese completely melted. Should take only 2-3 minutes. Remove from broiler. The video used for general direction and inspiration is below. Keep in mind that I wanted to use leftovers, so taking a cue from Laura, I added sliced tomatoes (tomatoes and spinach -- diet for acne! ), leftover goat cheese and mushrooms. Also, shredded cheddar was substituted instead of provolone and Kraft Grated Parmesan cheese was used instead of what she listed in the original recipe.